A collaboration between over 60 charities and non profit organisations across the UK, Baby Loss Awareness Week is held annually from the 9th to the 15th of October to raise awareness about the key issues affecting those who have experienced pregnancy loss or baby death in the UK. It is an opportunity for bereaved parents, and their families and friends, to unite with others across the world to commemorate the lives of their little loved ones. Now in it's 16th year, Baby Loss Awareness Week calls for tangible improvements in research, care and policy around bereavement support and highlights bereavement support and services available for anyone affected by the death of a baby at any age. bereavement care for thousands of families each year across England. You can find out more here. Baby Loss Awareness Week concludes each year on International Pregnancy and Infant Loss Remembrance Day, October 15th - with the global ‘Wave of Light’ where people from around the world are invited to light a candle or candles, at 7 p.m. local time, creating a Wave of Light in memory of babies who have died too soon. 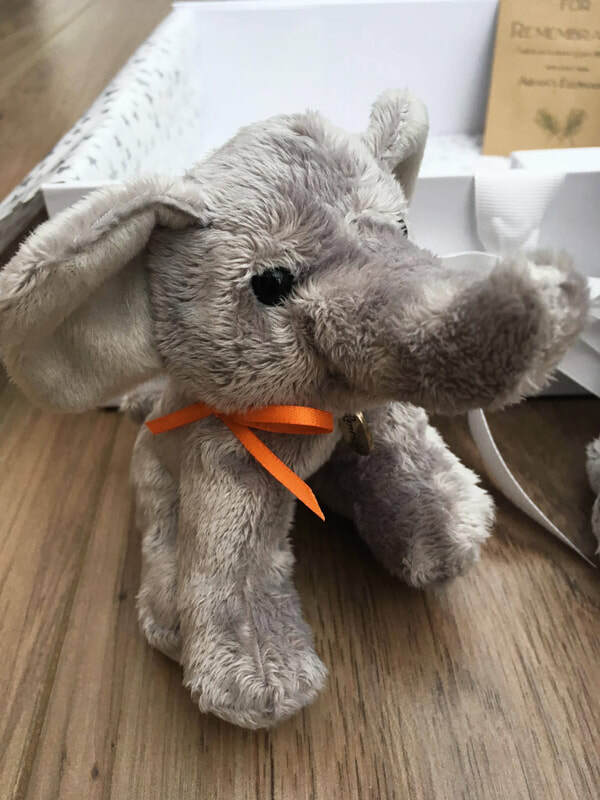 During Baby Loss Awareness Week, Aidan's Elephants joins over 60 charities and non profit organisations, to raise public awareness of key issues that affect those who have lost a baby or young child. Together we are committed to raising awareness of pregnancy and baby loss and improving support for all those affected. This year during Baby Loss Awareness Week we are launching a new project, 'In Our Shoes'. Our aim is to give a voice to parents' grief, to connect people and provide comfort for those who seek hope and reassurance from other people's stories and to provide information for friends, family and medical professionals who would like to find out how to better support someone who has lost a baby during pregnancy, at birth or in early childhood. Many newly bereaved parents actively look for stories from others who have walked in their shoes, to give them hope and reassurance that they can survive the incredible grief that they face after losing their precious baby. You can help so many other families by simply sharing your baby's story and talking about how you honour and remember them. Across this week, as in previous years, we will be sharing a social media graphic every day which can be shared to #breakthesilence #saytheirnames and open up conversations around #babyloss. For some families, this week is a welcome opportunity to talk, perhaps more openly than usual, about their babies and their personal experience of loss. For other families we understand that this week might feel overwhelming, with countless causes, movements, events and stories about baby loss being shared with prevalence in the news and social media. Whether you will be honouring your baby publicly, privately or amongst a small network of friends this week, please be gentle on yourselves. Share your baby's story when it feels right, and take comfort in honouring your little one(s) quietly when it does not. For anyone who would like to, you are welcome to use the graphics to start conversations with your loved ones and help them understand how they can support you this week and in the future. Thank you for being respectful and not removing our logo or altering the images in any way. We are asking that all our supporters write to their local representatives and ask them to raise awareness of baby loss and to help push for improvements in bereavement care and support following loss. Sadly, pregnancy loss or the death of a baby are not rare events and thousands of people in the UK are affected every year. This Baby Loss Awareness Week we want all MPs to find out why these bereaved parents should be offered high quality bereavement care and support, wherever they live in the UK, when they need it, for as long as they need it. On the 11th of October there will be an event in the House of Commons to raise awareness of baby loss and we want as many MPs as possible to attend. You can help right now by contacting your MP to ask them to find out about Baby Loss Awareness Week and come along to the event if they can. If you don't know who your local MP is, you can check here. To download a template email or letter to send to your MP, please click here. There are many events taking place during Baby Loss Awareness Week. On the 11th of October an event sponsored by the All Party Parliamentary Group on Baby Loss is taking place in the House of Commons to raise awareness of baby loss with MPs, followed by a remembrance service for MPs, peers and parliamentary staff. Baby Remembrance events for the public to attend are held throughout the UK and online. You can find information about all the listed Baby Loss Awareness Week events here. 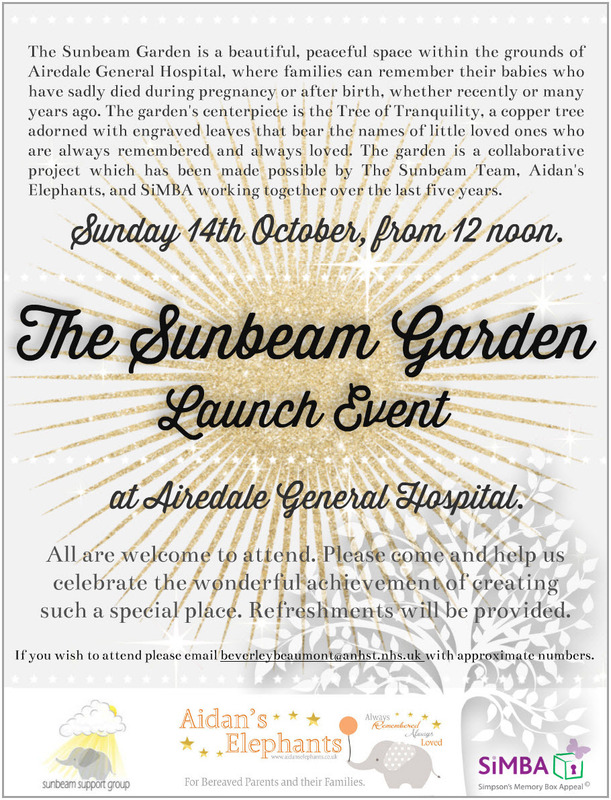 Airedale NHS Foundation Trust's Sunbeam Team have organised and are hosting an official Launch Event for the Sunbeam Garden (Baby Remembrance Garden) and the Airedale Tree of Tranquility on the 14th of October, the penultimate day of Baby Loss Awareness Week 2018. This event is followed by the Sunbeam Support Group's Wave of Light event on the 15th of October, the final day of Baby Loss Awareness Week. Thanks to the staff and supporters of Baby Loss Awareness Charity Partners, over 140 public buildings and landmarks will be lit up in pink and blue to mark Baby Loss Awareness Week 2018. You can see the map of the participating buildings and landmarks here. Every year, on October 15 (International Pregnancy and Infant Loss Awareness Day), people from around the world are invited to light a candle or candles, at 7 p.m. local time, creating a Wave of Light in memory of babies who have died too soon. Anyone can join a digital Wave of Light from 7pm on 15 October by posting a photo of their candle to Facebook or Twitter with the hashtag #WaveOfLight. We also provide a Wave of Light graphic on our social media channels every year, which families can share to request that family and friends light a candle for their little loved one(s).